Raining cats and frogs! | The Lola Boys Do The East ! Well, the luxurious part of our journey is proving less and less so by the minute! 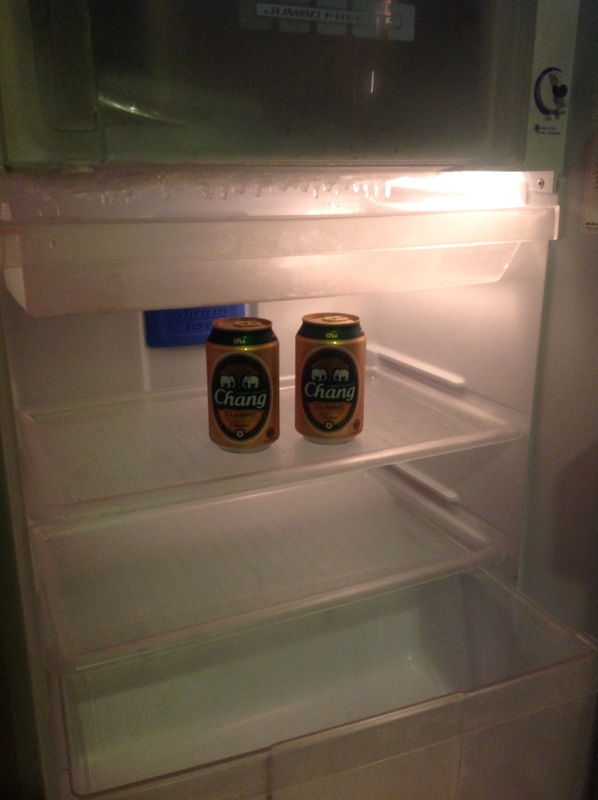 Of course, we always have the mini- bar on which to rely in desperate times. We opened it to reveal two miniature cans of the locally brewed Chang’ – not even enough to get a three week old pup merry. No ‘Changover’ in the morning though. Added to this there is a no smoking policy throughout the hotel, which, of course, my husband and I have followed to the letter. Inadmissably, they haven’t mentioned the no smoking of what – therefore we do have a get out if ‘Miss Hassan’ catches us having a sneaky puff on the balcony (over which we are not allowed to hang any clothes or towels). Along with the ‘Tenko-esque’ nature of the place another negative is that the family ‘Von Crap’ have moved in next door. A serious and Swedish brood consisting of at least six and a half young children with absolutely no skills when it comes to behaviour or tuning. The Sound Of Music it ain’t! Julie would be spinning! (although she isn’t quite dead yet)..
Oh, and have a mentioned the flight – path? At regular intervals the hotel guests are required to cling on, tsunami-like, to whatever is close by, as airliner after airliner threaten to clip the top of the palm trees in the courtyard. Any thought of conversation at these points is totally redundant, only mime cuts it. Our arms are so tired from over gesticulation it’s no wonder there are so many massage parlours in the area. This was meant to be the Judith Chalmers moment, in order to prepare for our Michael Palin adventure down the Mekong, although I think we may find the latter a little easier! I say ‘we’ as Andrew and I are over our Burton and Taylor moment so it looks as though I may have my Passepartout with me after all. As it continues to pelt it down outside, an indoor ball sport is, it seems, to be the only option worth pursuing …………. You should really write a book babe…it would be so, so entertaining!